The dollar is weaker on Thursday morning ahead of the expected release of the Republican tax bill and the expected announcement of the new Federal Reserve Chair. 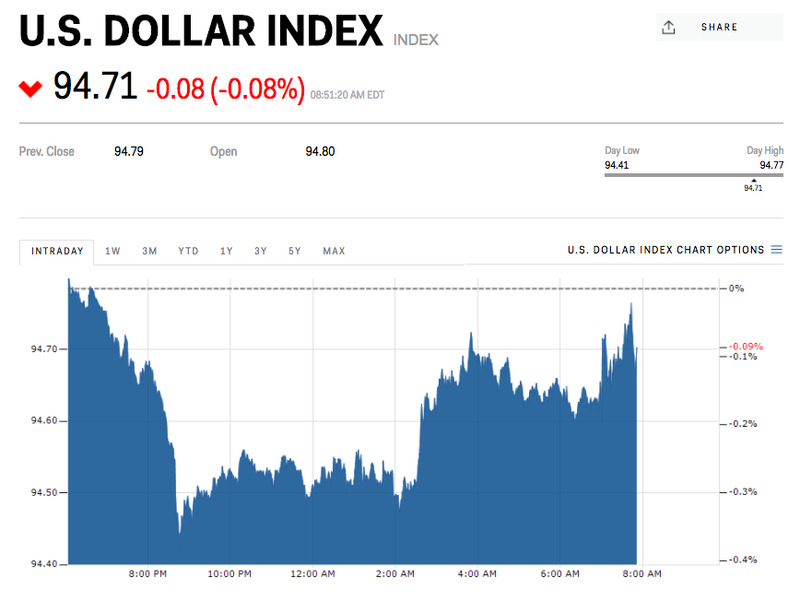 The US dollar index was down by 0.2% at 94.68 at 8:45 a.m. ET after being even further down around 94.50 during Asian trade. The Republican tax bill, which was originally slated to be released on Wednesday, is now expected to be released on Thursday. Analysts have argued that the delay — as well as the fact that reports have suggested some key details have been left until the last minute — are concerning developments. Separately, US President Donald Trump is expected to name current Fed governor Jerome Powell as the next Fed Chair later on Thursday. His expected nomination is largely seen as a safe pick, signalling continuity with the current low-interest rate environment and of the the slow approach overseen by current Fed Chair Janet Yellen. “Jerome Powell’s most important qualification is that he served with Janet Yellen. His confirmation should depend on his willingness to follow in Yellen’s footsteps on both monetary and regulatory policy,” Shawn Sebastian, co-director of Fed Up, a campaign from the Center for Popular Democracy, told the Washington Post.